This picture was taken in the capitol building in Washington D.C. It is a statue of Maria L. Sanford a well-known pursuer of knowledge. At the age of 16 she began her teaching career. She funded her own higher education using her dowry funds. She rose in rank as a national educator and became the principal and superintendent of many schools located in Pennsylvania. Sanford was very enthusiastic when it came to education. This is something we both have in common. As a professor at the University of Minnesota to which she was invited to become a faculty of, she lectured students on literature and art history. These are areas in education for which I have a deep respect for as well. Sanford would challenge her students every day to perform well in her classes. She was a political activist as well and gave speeches to many and believed strongly in women’s right, education for African Americans, and adult education. Sanford was well-traveled and gave more than one-thousand speeches. She later went on to creating the Minneapolis Improvement League which helped to further the causes she believed in. Sanford was picked in 1920 to give a speech at the state celebration when the 19th amendment was passed. The amendment gave women the right to vote. 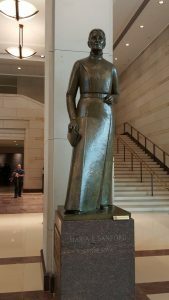 In 1958, Minnesota chose Maria Sanford to represent the state in The National Statuary hall in Washington D.C. This was decision well-fitting of a women who was well ahead of her times! Maria Sanford, Architect of the Capitol | United States Capitol, https://www.aoc.gov/art/national-statuary-hall-collection/maria-sanford (last visited Apr 3, 2017). This entry was posted in Uncategorized on March 31, 2017 by Mahendra Francis. This picture was taken in the capitol building in Washington D.C. 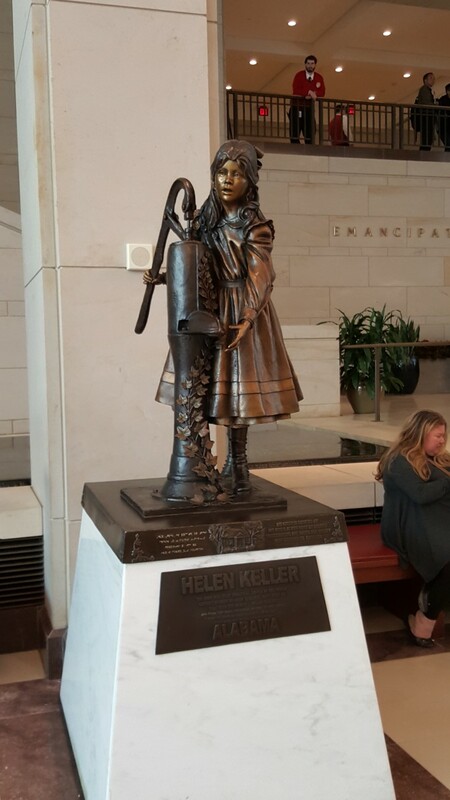 It is a statue of Helen Keller a well-known and respected individual. As a child she had been through many difficulties and through hard work and determination had overcome them. Keller was born on June 27, 1880. As a child she was both deaf and blind. With perseverance she became the first deaf and blind person to earn a bachelor of arts degree and went on to become an American author, political activist. She has set an example for many and showed that no matter the challenges one faced you can still succeed. Her birthplace in West Tuscumbia, Alabama, has become a museum and President Jimmy Carter in 1980 has declared her birthday to be “Helen Keller Day”. I believe that Keller was an outstanding example of how far human beings can go if they put their mind and effort into achieving something. She has empowered some many people including me to do the best we can. Her commemoration is duly deserved and I hope that many more people take the time to learn about her. Helen Keller, Biography.com (2016), http://www.biography.com/people/helen-keller-9361967 (last visited Apr 3, 2017). Walking in front the court house on Adams Street I came across a monument of Christopher Columbus which never seemed to amazed me. Explorer and navigator Christopher Columbus was born in 1451 in the Republic of Genoa, Italy. Columbus participated in several other expeditions to Africa. In 1492 Columbus left Spain in the Santa Maria, with the Pinta and the Niña along side. He has been credited for opening up the Americas to European colonization. A man of convictions, Christopher Columbus used his strong personality to persuade rulers and scholars to overlook the accepted theories about the size of the Earth to search out a new route to Asia. Although he wasn’t the first European to find American continent his journeys opened up the trade of goods and ideas between the two lands. For the past year I have walked past this monument and didn’t even had the chance to look.This monument is located in Camden Plaza East by Johnson Street. Henry Ward Beecher 1813-1887 the grateful gift of multitudes of all classes creeds and conditions at home and abroad to honor the great apostle of the brotherhood of man. I found out that Henry was an American abolitionist, speaker, minister and writer. He opposed slavery and also mocked auctions to help the slaves. 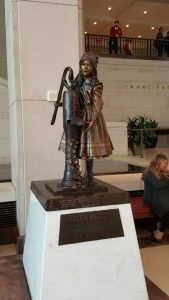 The figures of the children below the base of the monument symbolize the role Henry played abolitionist movement band his devotion to children. He also helped raised funds to supply weapons to others who opposed slavery. 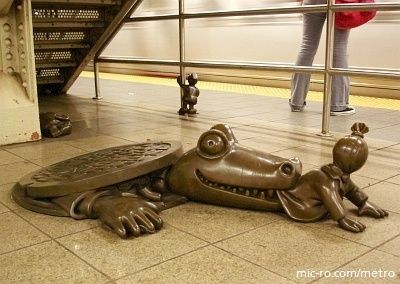 While I was taking my A train I saw this interesting status it’s located in 14th St./Eighth Ave. station, over there they have amount of little status where each of that one represent something interesting, especially the underground gators along with dozens of other whimsical creatures are part of the permanent art installation housed at the intersection of the A,C,E, and L lines. This is a the political cartoon-inspired project was commissioned in the 90s along with the station’s renovation when the start the station they put those status. A certain percentage of each renovation budget is dedicated to permanent art for the station and in this case that sum came out to $200,000. Another interesting status located 14th St./Eighth Ave is this crawling out of manhole cover and hauling off a moneybag headed figure into the netherworld. Some of the works are inspired by urban legends, where it said “I finished a lot of the original work in five years but the renovation took ten years so I had a chance to show them aboveground in a few places.” One of those places was the Doris Freedman Plaza at the corner of Central Park, Though the aboveground displays went up in the mid-90s, underground installation didn’t begin until 2001 and was completed in 2004. 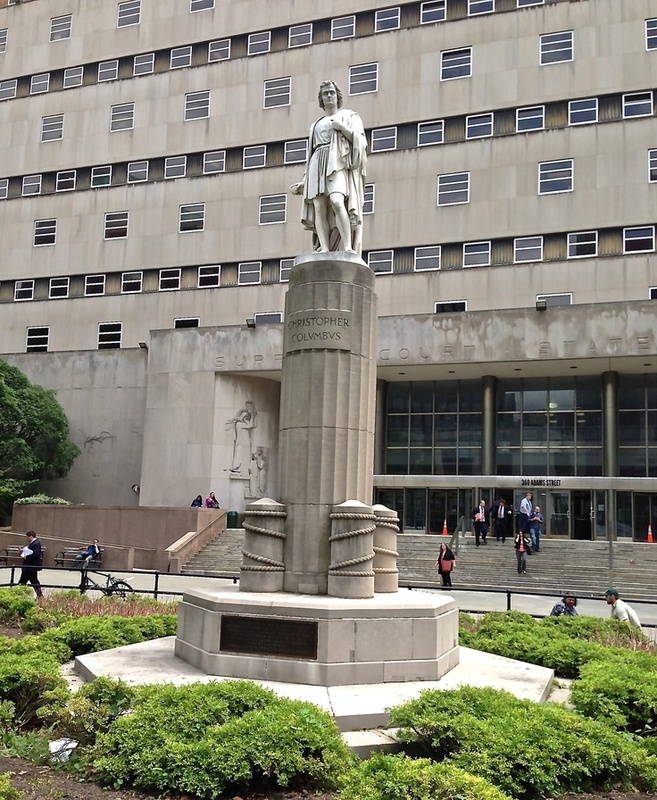 I live uptown Manhattan this monument is located in Broadway and St. Nicholas Avenue, between 167th and 168th Streets. 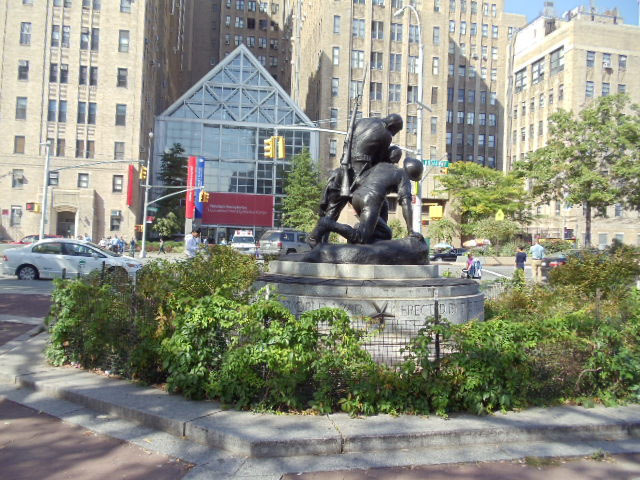 This is a representative monument of Manhattan of these three man where was this impressive monument stands at the apex of Mitchell Square, the memorial’s central image, was created by the esteemed sculptor and art patron Gertrude Vanderbilt Whitney who was born on the 1875 and died in 1942. The meanings of this status is a three figure group in bronze depicting two soldiers, one kneeling and one standing, who support a third slumping comrade in battle. This monument was dedicated on May 30, 1922 to honors those men from the adjacent communities in northern Manhattan of Washington Heights and Inward who gave their lives while serving their country in World War I.
Hi Everyone, I’m Phil from the OpenLab Community Team! This entry was posted in Uncategorized on March 21, 2017 by Phil. This is a test to see whether it is possible to post to the blog. This entry was posted in Uncategorized on March 21, 2017 by Mary Sue Donsky.